(Washington Post) -- Banks and lenders have maintained and marketed foreclosed properties far better in white neighborhoods than in minority neighborhoods, according to a report released Wednesday by the National Fair Housing Alliance. Investigators for the group evaluated more than 1,000 foreclosed properties in nine metro areas around the country — Atlanta; Baltimore; Dallas; Dayton, Ohio; Miami/Fort Lauderdale; Oakland, Calif.; Philadelphia; Phoenix; and Washington. They found that properties in predominately black and Latino neighborhoods were far more likely than those in predominately white areas to be left in disrepair, with maintenance problems such as broken or boarded-up windows, unkempt yards, water damage and unsecured entrances. In addition, foreclosed properties in minority neighborhoods were routinely less likely to have for-sale signs than those in white communities. Poor upkeep of so-called “real estate owned,” or REO, properties can have a detrimental effect on the surrounding community, forcing down property values, attracting crime and vagrancy and presenting potential health hazards, NFHA officials said. 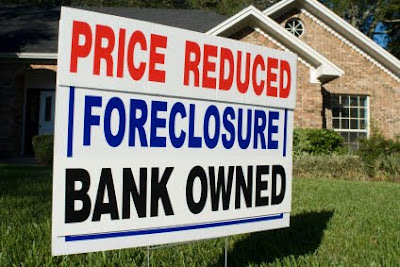 In addition, unsightly foreclosures are harder for banks to sell and often mean properties linger on the market longer than they might have otherwise. “The inferior way in which banks maintain and market their REO properties in communities of color actually changes the character of and serves to degrade the quality of life in these neighborhoods,” said the report by NFHA, a consortium of groups from across the country dedicated to eliminating housing discrimination. The problem of vacant, abandoned and uncared-for foreclosures has plagued virtually every community in the country in the wake of the housing crisis. Cities and counties have tried with mixed results to force banks and delinquent homeowners to better maintain their properties. Cash-strapped municipalities have tapped their shrinking budgets to care for crumbling homes. Some localities have taken to demolishing some long-vacant homes altogether. At the same time, minority communities have been hit particularly hard by foreclosures, in part because of the higher proportion of subprime loans concentrated in those communities. That makes it even more important that foreclosed homes in those neighborhoods be maintained properly, said NFHA President Shanna Smith. The investigation, which took place between May 2011 and February 2012, was funded in part by a grant from the Department of Housing and Urban Development. Smith said government-backed mortgage giant Fannie Mae had approved an additional grant to extend the inquiry into other regions. The report does not name the banks that own the foreclosed properties that were surveyed, and NFHA officials declined to disclose that information, but they did say they plan soon to file administrative complaints with HUD based on their findings.